Kevin Keene was your average retro video game lover. An avid Nintendo fan, he spent most of his days playing the classic NES, instead of doing anything more responsible. On the other side of the television screen, in the kingdom of Videoland, the evil Mother Brain has started to seize control. The two worlds collide when Kevin is summoned from his world to the game world in order to become the Savior of Videoland: Captain N! Princess Lana: The acting ruler of Videoland, Lana has taken to letting Captain N lead her forces against the evil plots of Mother Brain. She is quick-witted, beautiful and epic royalty. Not to mention she may or may not be the romantic interest of our game playing hero. For the record, though, this is one damsel that doesn't know the meaning of the word distress. Mother Brain: The sinisterly evil creature that's determined to take over Videoland. Mother Brain has legions upon legions of evil cronies to do her bidding, whether they like it or not and she will stop at nothing to have Videoland tightly gripped in her cerebral clutches! 01 Reset Synopsis: A devastating attack from Mother Brain rocks the Palace of Power and turns the tide in the war. So much so that Princess Lana gets assistance from the Real World in the form of Kevin Keene, a video game guru that's destined to become the superhero known as Captain N! Captain N is a reboot of the original Captain N: The Game Master television series. The creators hope to update the idea and give it a bit more flair, while staying true to the idea that made the original show a small success. 1) Nintendo fans will be delighted to know that all of their original heroes are involved in the new N Team, as well as some of the newer ones. Kid Icarus, Mega Man and Simon Belmont will all return to help Kevin save the day. 2) Captain N isn't the only Game Master. Rumor has it there's another one crawling around in Videoland somewhere. Look for 'em this season. 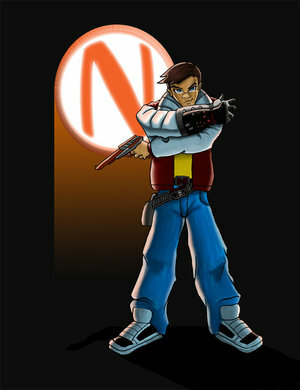 Credit goes to Sprinterz on DeviantArt for the Captain N picture above.